The fourth situation is whatever the situation it’s always Mom v/s Kids! Imagine your children are fighting tooth and nail as if the whole world’s survival depends on it, you walk in and try to resolve the issue, thereby ensuring the house does not collapse around your ears. End of story right? NO! The moment you jump in to try and resolve the matter so that your children don’t bite off each other’s heads, it somehow turns on you. They find some unexplainable way, wherein you are at fault and suddenly both of them are on the same team! The weird thing is when they say it; even you believe that it was indeed your fault! That’s the biggest lesson I have learned from my experience. The moment my children start fighting, I just call for a timeout – bark instructions to keep both of them at two ends of the house and at times even throw in a punishment or two, but never ever ask them the cause. Asking for cause is inviting trouble. 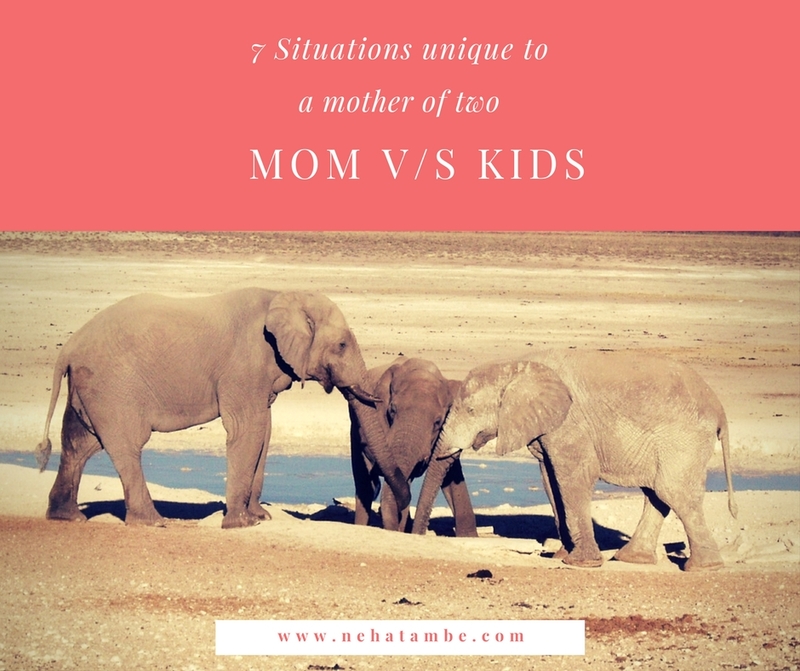 You will have to listen to both the sides with both of them shouting at the same time, you will not make head or tail of the problem because usually there is none and finally you will be labeled a difficult mother who never understands. The worst is if you pass a judgment where you blame one child for something, suddenly the other child will come to his defense, console him/her saying “don’t worry I understand, Mom doesn’t get it” and the likes. And you start to wonder why in the first place did you get into this mess? Say you are trying to get your younger one to eat some veggies and by virtue of trying to bolster the older one’s image and make her feel good you give her example. “See how your sister eats everything on her plate, She is a strong girl because she eats everything without complaining” You would expect a beaming smile from the older one, but nine out of ten times, she will quip “That is because you made me eat everything when I was young, just like you are making him eat!” And so the mom-bashing starts with both exchanging notes of how mom made them eat all kinds of things without considering their choices. Or how she makes the same old things and never tries anything new. The darn television ads don’t make your life easy, especially those savory and chocolate ads. The moment those ads run, children will note the virtues of that product and repeat it to you asking why you don’t let them eat such ‘good things’ daily. Did you ever experience such things? How did you manage without being sucked into it? Hey Shalini, It’s always nice to see a comment from you. Happy to know that you enjoy reading it even when you can’t identify with the situation. hahaha, Neha I completely get it. I am going crazy with my about-to-be-two years old and I can’t even imagine having another one, I might hide under the bed if I have two running screaming kids at home. So bravo you are managing so well. Well on the eating part, I pray to God, I request my son, I do every darn thing to make him eat – I am in a situation that I’ll be happy even if he eats chocolate!!! But he refuses everything! I havn’t started experiencing these things yet. But I can so relate to this from my childhood when it used to transform from me v/s sister to us v/s mom. Thanks for the good laugh. And all the best for your challenge! hahaha Neha I loved reading the post… MOM bashing needs no reason I complete agree – just yesterday when I told my lady to finish her breakfast as she’s getting late to school her reply was – it’s because of you mum I always get to bus stop late… I was like WHAT!!!! Its an wonderful post, some common incidents penned very nicely…logically too.